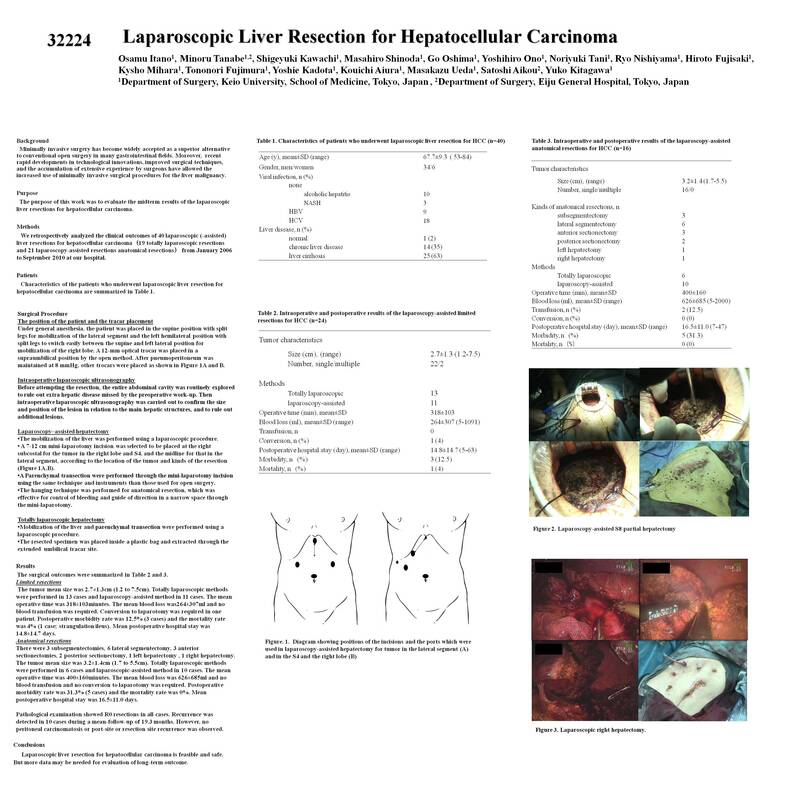 INTRODUCTION: The purpose of this work was to evaluate the midterm results of the laparoscopic liver resections for hepatocellular carcinoma. METHODS: From January 2006 to September 2010, there were 40 laparoscopic (-assisted) liver resection for hepatocellular carcinoma carried out at our hospital. The patients comprised of 34 males and 6 females with a mean age of 67.7+-9.3 years. Eighteen patients were HCV-positive and 9 were HBV-positive. Others without viral infection consisted of 10 alcoholic hepatitis and 3 NASH. The background of the resected livers were 18 Child-pugh A and 22 Child-Pugh B. Laparoscopic-assisted procedures consisted of laparoscopic mobilization of the target organs, followed by open resection and reconstruction through an 8-12 cm extraction site. RESULTS:As to limited resections, tumor mean size was 2.7+-1.3cm (1.2 to 7.5cm). Totally laparoscopic methods were performed in 13 cases and laparoscopic-assisted method in 11 cases. The mean operative time was 318+-103minutes. The mean blood loss was264+-307ml and no blood transfusion was required. Conversion to laparotomy was required in one patient. Postoperative morbidity rate was 12.5% (3 cases) and the mortality rate was 4% (1 case; strangulation ileus). Mean postoperative hospital stay was 14.8+-14.7 days. As to anatomical resections, there were 3 subsegmentectomies, 6 lateral segmentectomy, 3 anterior sectionectomies, 2 posterior sectionectomy, 1 left hepatectomy , 1 right hepatectomy. The tumor mean size was 3.2+-1.4cm (1.7 to 5.5cm). Totally laparoscopic methods were performed in 6 cases and laparoscopy-assisted method in 10 cases. The mean operative time was 400+-160minutes. The mean blood loss was 626+-685ml and no blood transfusion and no conversion to laparotomy was required. Postoperative morbidity rate was 31.3% (5 cases) and the mortality rate was 0%. Mean postoperative hospital stay was 16.5+-11.0 days. Pathological examination showed R0 resections in all cases. Recurrence was detected in 10 cases during a mean-follow-up of 19.3 months. However, no peritoneal carcinomatosis or port-site or resection site recurrence was observed. CONCLUSION: Laparoscopic liver resection for hepatocellular carcinoma is feasible and safe. But more data may be needed for evaluation of long-term outcome.